Gael is an uncle-like figure to the Painter. Though his exact relation is unknown, he certainly resided in the Painted World for some time, at least until the Painter was locked up. At this point, he took the rotted remains of the physical portal to that world with him, attempting to find the Ashen One to complete the prophecy that would burn away the rotted world so that the Painter could replace it. 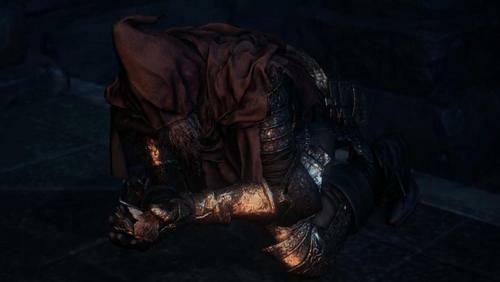 Gael can be found praying before the statue next to the Cleansing Chapel bonfire in the Cathedral of the Deep. Upon encountering the Ashen One, he requests the One to free The Painter and show her the flame that would burn the rot. Once they come into contact with the piece of the painting he carries, the Ashen One is transported to the Painted World. There, in the fight with Ariandel and Friede, the flame is reignited, and The Painter comments that she will wait until she can see it before beginning the painting. To do that, she needs the pigment she intends to use, which she reveals to be the Dark Soul itself, discovered by the Furtive Pygmy and used to create all of humankind. She also mentions that Gael intended to get it for her, for he has set out on a new mission to find it, and she wonders whether or not he has found it already. Gael's mission leads him to The Ringed City, where he came upon the pygmy lords. Their blood had long ago dried, and so consumed the Dark Soul, making it useless to him. Driven mad by this revelation and determined to complete his mission, Gael slaughters the Pygmies, cutting their throats and drinking their dried blood, in a desperate attempt to take the Dark Soul for himself. But even he realized that the Dark Soul was too powerful for him to handle, and it mutated his body, causing him to grow in size and warp his mind. And so the Ashen One finds Gael fully corrupted by the Dark Soul. Gael can be summoned to fight with you in both the Painted World of Ariandel and the Dreg Heap. There is a slight chance that Gael was the one who cracked open the egg that Filianore guards when searching for the Dark Soul. This relies on a warped timeline though because the Painter he has a close relation to is rumored to have come from that egg. It wasn't until the Painter's world started to rot though, that he began his quest for the Dark Soul to make a new painted world. So many other things are cyclical in the world of Dark Souls though. Wait, you've… You've the same scent as that woman… Then you must be an Ashen One. You must be! You don't know how long I've searched! Ohh, ohh… don't mind me, didn't mean to fall apart. Now, Ashen One, I have a kindness to ask of you. My lady lives in the cold land or Ariandel. I need you to show her flame. A proper flame, that will burn the rot away. If you truly are Ash, then it must be fire that you seek? And then, the Ashes were two. Oh. Are you certain of that? Hogwash, hogwash. What Ash does not seek fire? Ahh, you again, I knew it. As any ash seeks fire, you will surely help me! My lady lives in the cold land of Ariandel. 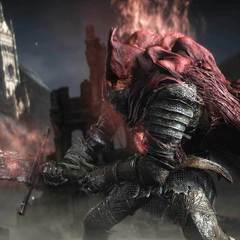 The red-hooded, wandering slave knight Gael sought the blood of the dark soul as pigment for the Painted World. But Gael knew he was no Champion, that the dark soul would likely ruin him and that he had little hope of a safe return. Blood of the dark soul that seeped from the hole within Slave Knight Gael. Used as pigment by his lady in Ariandel to depict a painted world. When Gael came upon the pygmy lords, he discovered that their blood had long ago dried, and so consumed the dark soul. Greatsword of a debauched executioner used for beheadings. This sword retains a keen memory of its executioner's duty, and absorbs FP from each fallen foe. Shield of the Holy Knights of the Sunless Realms. Engraved with a brilliant flame crest that burns brightly within the order's customary sunset colors. This design symbolizes those who both harbor and oppose the power of flame.